Ant species checklists representing local species pools across 159 islands and areas in East Asia were compiled, including Japan, South Korea, North Korea, China and Russia (Far East). The records represent nominal valid species and are based on 1093 publications from 1874-2014. This .txt file consists of two columns, listing species and area names. The preceding letters before the area names separated by an underscore abbreviate countries or island archipelagoes where the areas belong to (C China, DT Daito Islands, IZ Izu Islands, J Japan, JM Japanese main islands, NK North Korea, OG Ogasawara Islands, R Russia, RC Ryukyu Islands - central, RFE Russia Far East, RN Ryukyu Islands - north, RS Ryukyu Islands south, SK South Korea, SKM South Korea mainland, SN Senkaku Islands). Aim Biodiversity patterns reflect both ecological and evolutionary processes interacting with geographical variation in climate and the current and historical connectivity between land areas. We sought to disentangle these effects in explaining the organization of ant diversity across geographical areas and islands in East Asia. Location The Japanese Archipelago including the Ryukyu and Ogasawara Islands, Taiwan and coastal continental regions of Korea, China and Russia. Methods We aggregated species occurrence records from published literature, specimen databases and museum records, and compiled climatic variables for islands and politically defined continental areas. Current and historic land connections in the Last Glacial Maximum were determined using bathymetric databases. We analysed factors driving patterns of Simpson composition dissimilarity using multiple regression of distance matrices (MRM). Results Temperature was the largest driver of dissimilarity among areas, with geographical distance and historical land contiguity also being important. Current land contiguity had no detectable effect. Main Conclusions We found climate to be a primary driver of ant diversity patterns on large scales, consistent with previous work on ants and other organisms. Interestingly, land connectivity during historical periods of low sea level was more important than current land connectivity in explaining faunal similarities. 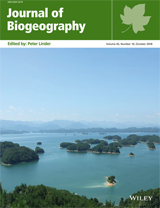 This implies that despite the potential overwater dispersal of ants, overland dispersal via transient land connections is a more important driver of regional-scale biogeographical pattern in East Asia.